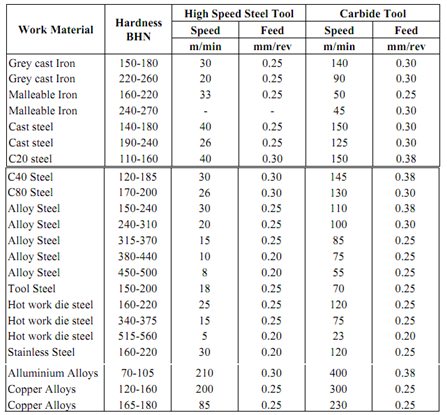 Expressed in terms of mts./min, it is the speed at which the metal is removed by the cutting edge from the work piece. N = Spindle speed (RPM). Feed is defined as the distance the cutting tool advances per one revolution of the work. It is expressed in mm/rev. This is the distance between the unfinished surface of the work and the bottom of the cut, measured in a direction normal to the machine a surface of the work. dc = Dia. of finished work.